Sandy Wells interviews former W.Va. House of Delegates sergeant-at-arms Marshall Clay in April 2017. Wells was a reporter for the Charleston Gazette and Gazette-Mail for more than half a century. 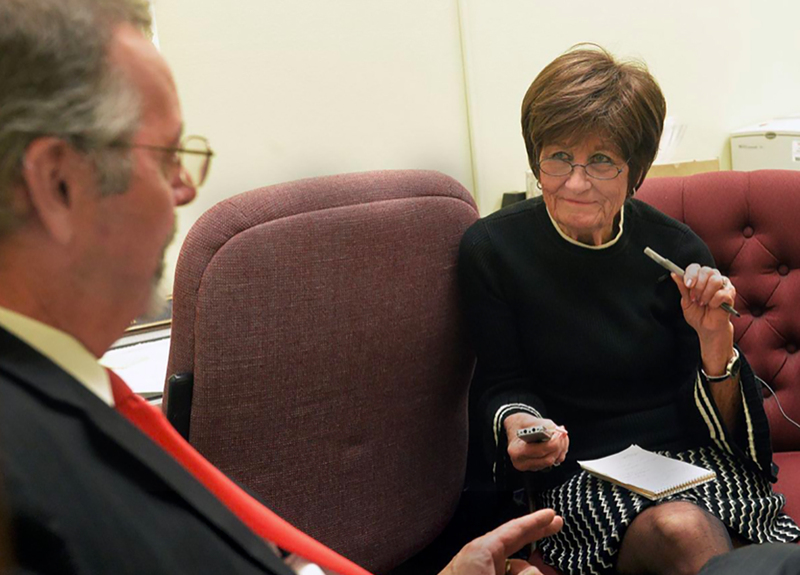 CHARLESTON, W.Va. — Sandy Wells, a reporter and columnist for the Charleston Gazette and Gazette-Mail for more than half a century, died Saturday at the age of 77, after fighting cancer for more than a year. Wells was best known in recent years for her “Innerviews” column, which she continued after retiring from her other duties as a reporter. 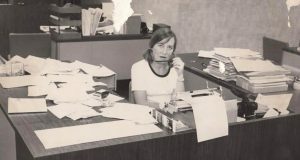 The column’s first-person style, where she asked questions and let her subjects tell their own life stories, came about when former Gazette Editor Don Marsh noted he liked the first-person columns written by journalist Studs Terkel. Wells tried a couple, and suggested it become a weekly feature. The first one appeared on Sept. 21, 1988, and the last one ran in print on Jan. 29 of this year. Except for a couple of weeks late last year when she was in the hospital, Wells never missed a week. As fashion editor at the Charleston Gazette, Sandy wells wrote and edited stories and designed the section’s pages.